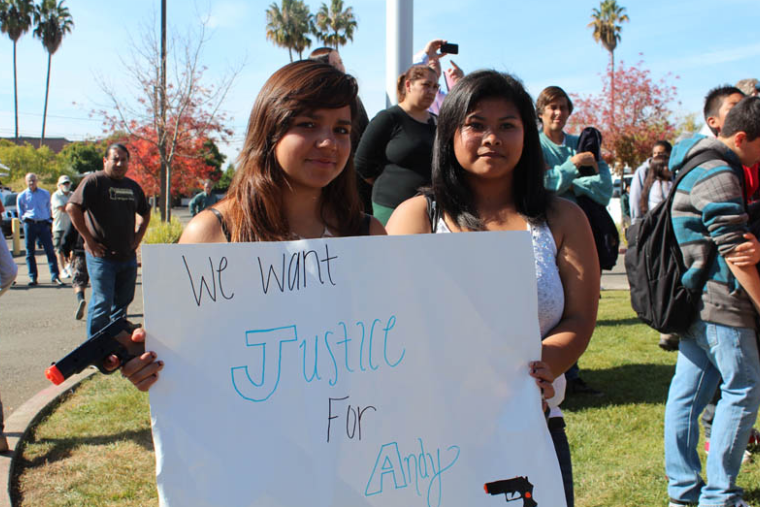 Protesters at a rally for Andy Lopez on Oct. 25, 2013. What a country we live in: In open-carry states, a mostly white group of chubby second amendment “gundamentalists” have taken to carrying actual assault weapons into retail and fast-food outlets with not much pushback from police, while in California, a 13-year-old Latino kid gets shot and killed by police while openly carrying a toy gun in a semi-rough Santa Rosa neighborhood. Meanwhile, there’s a school shooting practically every week—and thus the battle lines are drawn between arming everybody and, gee, how about some sane gun laws? Indeed, the Andy Lopez shooting last October has highlighted numerous disconnects in how American society is utterly failing to deal with unpredictable and sometimes foolhardy behavior by teens, within a larger edgy framework of school shootings and in a country that has clearly gone quite nuts over gun rights. Sonoma County District Attorney Jill Ravitch entered the firearms firestorm this week as she took a pass on charging Sonoma sheriff’s deputy Erick Gelhaus with any crime in connection with the fatal 2013 police shooting of Lopez, who was shot by Gelhaus, an Army veteran, while carrying a replica AK47 in broad daylight. Against a backdrop of lone-nut school shootings by mostly young white men of a certain disposition (angry, weird and relatively well-off), and within the larger national argument over gun rights in open-carry states, the Lopez shooting flatly underscored the limits of gun possession as a means of self-expression—what’s good to go at a Target in Texas is a total no-go in a poor and Latino Santa Rosa neighborhood. Ravitch’s decision came after months of speculation and angry charges leveled at her office that she was slow-rolling the investigation of the October shooting out of a concern for her June electoral prospects. Yet Ravitch made quick work of her opponents in winning another term as district attorney. The 52-page public report issued by Ravitch sheds some light into the great lengths she went to investigate the shooting free of political pressure, no small feat in a city that has been on edge for months, with activists vociferously demanding justice for Lopez and criminal charges against Gelhaus. There’s two rough through-lines animating the Ravitch report: It emphasizes the obvious tragedy of a young man’s death, and signals empathy by repeatedly calling him “Andy,” even as the report essentially lays out an argument that Lopez played a major role in the events that led to his death. Did Lopez “deserve” to die for disobeying police orders to drop the fake weapon? But numerous John and Jane Doe witnesses contacted by police and investigators after the shooting corroborated Gelhaus’ version of the incident—in particular, the critical moment where Gelhaus and his partner Michael Schemmel told Lopez, twice, to drop the weapon he was carrying. Instead of complying with the police order, the report says Lopez inexplicably turned to face the officers, and that as he did so, the barrel of the replica weapon started to rise, as though Lopez was prepared to shoot at the police. Gelhaus said he feared for his life, his training kicked in, and he shot at the teen eight times, hitting him with seven bullets fired over about two seconds. One John Doe witness told police he had warned Lopez from his car, moments before the fatal encounter, to drop the weapon because the police were right behind him, in a marked cruiser. Lopez ignored him and continued walking down the street. And, the report notes that Lopez’ judgment may have been impaired because of the marijuana he smoked within 90 minutes of getting shot. But it’s also true that Lopez was simply victimized by a “wrong place, wrong time” set of social constructs now wrenching at the core of American society—in particular, the rise of the angry and armed young man hell-bent on some kind of justice against a world that done him wrong.